Piazza Venezia is located in Rome, Italy, and is a central traffic hub that has many intersecting thoroughfares, such as the Via del Corso, and the Via dei Fori Imperiali. 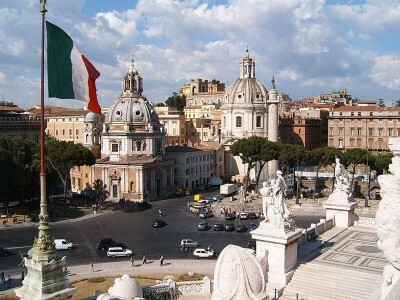 This square is situated at the base of the Capitoline Hill, and is very close to Trajan’s Forum. The Viale di Fori Imperiali begins at this famous square, and leads directly to the Coliseum and the Roman Forum. Most tourists visiting Rome end up spending time visiting the Piazza Venezia. The Piazza Venezia is just a quick walk to a number of Rome’s most well-known sights, such as the Roman Forum, Capitoline Hill, Palazzo Venezia, and the famous Pantheon. On the south side of the square is the Il Vittoriano, also called the Monument of Victor Emanuel II, it was built from 1855 to 1911 to commemorate the unification of Italy. On the north side is the Palazzo delle Aste, and the Palazzo Bonaparte. The San Marco Church is also located nearby, and was founded by Pope Marco, in 1336. It was rebuilt in 1833 and the tower is the sole remaining section of the original church. This building was constructed by Pietro Barbo, from 1455 to 1464, who later became Pope Paul II. This civil Renaissance structure is amongst the oldest in Rome. The structure is near the San Marco church. The palace was a papal home before Pope Pius IV transferred it to Venice, who then used the Palazzetto Venezia as an embassy. In 1916, it was obtained by the government. Benito Mussolini, Italy’s leader, used the property as his headquarters and often addressed the Italian citizens from its balcony. The structure currently houses the interesting Museo del Palazzo Venezia. This is a museum that as a very large historic collection of decorative arts, such as early Renaissance paintings, tapestry, suits of armor, sculptures, and ceramics. One dominating landmark at this location is the Il Vittoriano, which is a monument devoted to King Victor Emmanuel II, who was Italy’s first king. In the early part of the twentieth century, this white marble monument was built on one side of the Capitoline Hill. This construction completely changed the appearance of the Piazza Venezia. The Il Vittoriano has received some criticism because many believe it clashes with other architectural styles in the area. Many visitors enjoy the magnificent views from the top of this building. One large structure was moved so it would not block the view of this important monument. The Palazzo Generali is situated across from the Palazzo Venezia. It was constructed from 1906 to 1911, and is a reproduction of the Palazzo Venezia. The structure replaced two palazzos which had been destroyed in 1900, so the square could be expanded. The Palazzo Bonaparte is located on the right side of the square. It is named after Emperor Napoleon I’s mother, Letizia Bonaparte. After the end of Napoleon Bonaparte’s empire, Pope Pius VII awarded Letizia Bonaparte asylum. She lived in this wonderful seventeenth century palace until her death in 1836.